He was seen as a revolutionary and a heretic of his time. Illness was regarded among the intelligencia of the day as a retribution form the Gods for displeasing them. The answer to illness then was to appease the Gods with offerings. 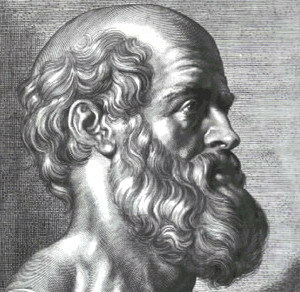 Hippocrates a physician and teacher of the time, had set up a hospital in the temple grounds where he and those physicians he taught administered to the sick and suffering. No doubt he made many enemies as he taught his heresy to the physicians of the day. He published outlandish statements like, “let thy food be thy medicine”. In his writings it was recorded, “look well to the spine for the cause of dis-ease”. He taught natural laws required our learning, and practicing in order to have a full life and abundant health. He observed sunlight, fresh water, sleep, fresh live foods, herbs, a calm mind, and a good mental attitude were all elements in abundance, supplied for free by Nature. The oath, the promise itself is all that remains of Hippocrates’ teachings in alopathic medicine today, as the drug empires throughout the world pedal their pills, potions and elixirs. Alopathic medicine has a legitimate place in our world. It provides first aid, crisis care, life saving treatment, and symptom alterating medicines, and if all that fails then invasive surgery can be applied. Alopaths, medical doctors, succesfully treat diseases and symptoms with drugs and surgery from the outside in. Drug it out, or cut it out. All of which in some instaces is neccessart and does save lives, however because of it’s invasiveness comes with side effects and possible complications. Fresh water, sunlight, clean air, living foods, herbs, homeopathic cures, and all Manner of Nature’s abundant bounty. He taught that “health care” ought to be Natural and preventative, building a strong and vibrant host, and not treating sickness and symptoms. He practiced an early form of Naturopathy, and Chiropractic according to his writings even manipulated the spine. He was a heretic, a revolutionary and according to the prejudice of the time in opposition to the “evidence based” science of the time. Sound familiar? We teach and practice all things natural. We are not against or in any way in opposition to organised medicine, drugs or surgery. They all save lives and are a respected practice in our time, however non of these invasive processes have anything to do with “health care”. Chiropractors teach that health is simply a Life Style utilising all pf Nature’s gifts. Your comments are welcome. Call Debbie or Nancy for a Massage with Mari, or Chiropractic appointment with Richard 0409 570246.